For over 20 years, Monroe County residents have trusted Jennifer Rosenkranz to capture their cherished memories on film. As the owner of JR Photography in Waterloo, Jennifer takes pride in photographing newborns, families, high school graduates, weddings, and even pictures with Santa. Each day, she counts her blessings for a job that doesn’t feel like a job. When Jennifer isn’t snapping pictures of perfect smiles, she spends a lot of time behind her computer editing, uploading, downloading and emailing large image files to customers from her studio adjacent to her home. 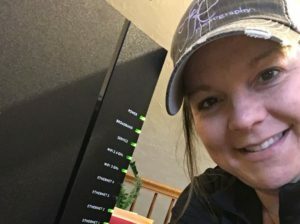 For years, this meant needing to have two separate Internet connections – one for home and one for her business. The answer came in the form of a new product offering from HTC called the GigaCenter. This high-powered router solution is perfect for home and business applications. While conventional routers provide very reliable service, the GigaCenter offers cutting edge technology that maximizes speed and signal strength. Think this sounds too techy for you or your needs? Think again. The HTC GigaCenter utilizes smart-technology which allows the system to automatically manage bandwidth to ensure maximum speed is provided to those devices requiring it at that time – an option that is vital for today’s home and the increasing number of web enabled devices. Additionally, Jennifer chose the managed WiFi capabilities option. This means that now nearly any Internet questions can be addressed simply by calling an HTC representative and they can address it from their office. A Mesh extender completed the technology upgrade and provides the required extended reach and signal strength to support WiFi needs in both her home and office. Knowing they cared enough to respond to her request, provide excellent solutions and will be there for any issues down the road made Jennifer thankful she chose HTC with her home and business connectivity needs.